Newport made two changes to their starting line-up from the team that drew 1–1 against Verwood Town the previous Saturday. Scott Barron replaced the injured Neo Lamb as right back, and last Saturday’s man-of-the match, Joe Craig, came in for the injured Liam Triggs in midfield. Newport kicked off towards the allotments end on a soft pitch in mild but overcast conditions. The first half began as a very open and engaging contest with chances for both teams, which neither side were able to convert. 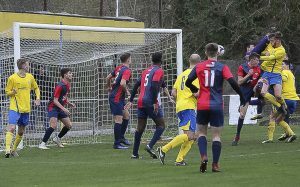 The first chance came in the 7th minute to New Milton Town, when Scott Sampson uncharacteristically gave the ball away to former Port player Aidan Radford, who shot past Gary Streeter’s right post. The Linnets had a further chance in the 22nd minute, which was cleared off the Newport goal line. However, the lion’s share of chances fell to the home side, who could easily have gone into the half-time break with a two or three goal advantage. Joe Craig had the first of many chances which he failed to convert in the 9th minute. Jared Wetherick had a curling shot fisted over the crossbar in the 14th minute and almost scored with a header from the resulting corner. A minute later, Joe Craig had another of his efforts cleared off the line. Then it was Mark Taylor’s turn to fail to score, with a deflected shot in the 18th minute, and shooting past the right post in 23rd. Jordan Browne then came close to scoring in the 24th minute, with a shot deflected past the post, followed by Joe Craig nearly putting Port into the lead with a header from the resulting corner. Port’s final chance of the first half fell to Connor Kelly, who shot at the keeper after being put through by Mark Taylor. The first half ended on an unpleasant and controversial note, when Jared Wetherick made a sliding tackle on an opponent, leading to his sending off. 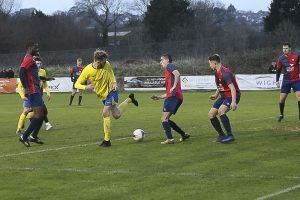 The Newport centre forward connected with the ball and did not appear to have made the challenge with malicious intent; however, the the Linnet’s player was unfortunately injured in the challenge and had to be carried off the pitch. Perhaps as a result of the injury and the sending off, the second half was not as enthralling and engaging a spectacle as the first, with far fewer chances. 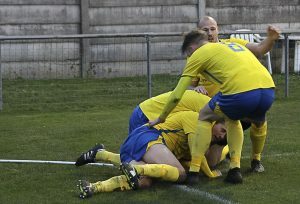 However, ten-man Port finally scored in the sixty-first minute when, after a goal mouth scramble, Joe Craig back-flicked the ball to Jordan BROWNE, who then smashed the ball into the Linnet’s net from ten yards. The crowd feared Port might be reduced to nine men after Mark Taylor (who had already been yellow carded) clashed with the opposing keeper, and was given a prolonged talking to by the referee. However, he had to leave the field with a cut mouth, rather than a red card, to be replaced by Harrison Yates. Despite their one-man advantage, the Linnets offered very little threat up front in the second half, and Port saw out the game comfortably to win 1–0. Unfortunately, in the closing minutes of the game, Gary Streeter appeared to have injured himself jumping to meet a cross, and required attention on the pitch after the final whistle. After the game we could establish that Gary received a bang to the head as he jumped for the ball and was left with nothing more than a headache. All photos courtesy of Broonpics sports photography.